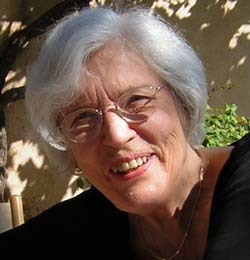 Betsy Jolas Interview with Bruce Duffie . . . . .
Having done over 1600 interviews in my career, it is pleasing to have used portions of just about all of them on the radio. It is also gratifying to now be placing some of them on the internet. Perhaps the best (and most surprising) thing is to find that they have held up well over so many years. I am proud of them in every way and hope that you who read them feel they are worthwhile. 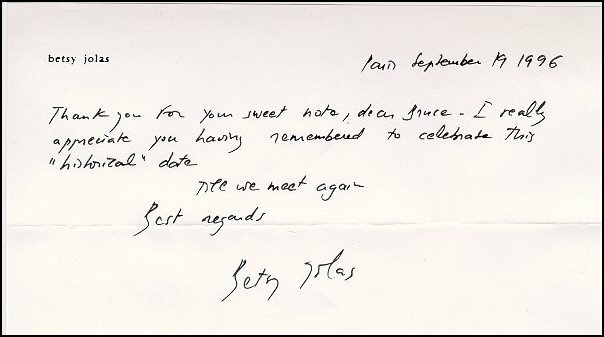 I do not remember the exact circumstances which led me to Betsy Jolas, but once I discovered her music I made contact with her and arranged a conversation on the telephone. 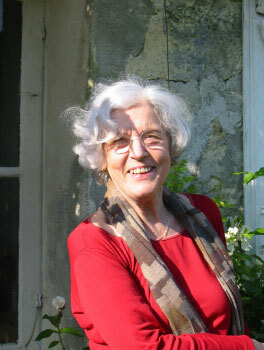 A short biography of her appears at the end of this presentation, and more information can be obtained at her website, which is in both French and English. The call took place in the summer of 1991, and we spoke for about a half-hour. Being a night owl, the wee hours of the morning were the best for this one — since I was in Chicago and she was in Paris. I was still awake (as always) and she was just getting started with her day. Here is most of what was said at that time . . . . .
Bruce Duffie: You are both a composer and a teacher. How do you divide your time between those two very exacting activities? 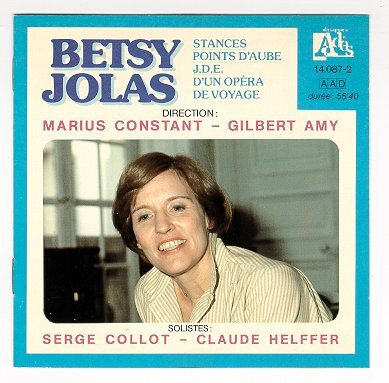 Betsy Jolas: I haven’t been a teacher all my life, you know. 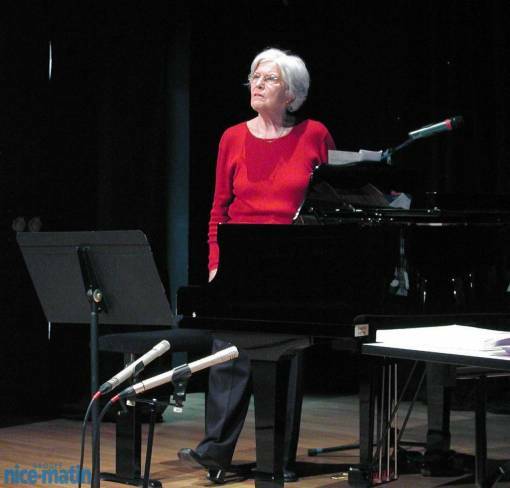 I started teaching in 1971, when I became Olivier Messiaen’s assistant at the Conservatory. He had been my teacher, you know. BD: Was that especially gratifying, then, to be able to work alongside him? BJ: It was absolutely wonderful. It was absolutely the best class that you could possibly have at the Conservatory. He really had the best students; he was the best teacher. He was the best of everything! BD: Did you learn more when you were his student, or when you were his colleague? BJ: It was totally different because I had sort of kept away from the Conservatory once I had finished my studies. Coming back to this school through the big doors, so to speak, was an incredible experience because all the students he had then have become famous since. They represented a very interesting tendency. In my generation, we were brought up sort of in twelve tone, post-war, around Boulez and domaine musical, and these men and women — there were some women, too — were not interested in that anymore. They were building something new, which became what is known as spectral music. These were people like Levinas and Grisey and Murail, and they were all his students at the time. BD: Have you have continued his tradition, or are you building your own tradition? BJ: I’m not in that tradition at all, myself. I was interested in those students, but my own music has not evolved that way at all. In fact, I never wrote any twelve tone music, if you really want to know! I have followed all these movements very actively, but I believe I’m considered sort of independent. BD: Is that the best way to go, really? BD: Now you are both teaching and composing. Do you get enough time to compose? BJ: I find the time. It’s just something I have to do, otherwise I can’t live. It’s just so necessary, I always find the time. I’ve never stopped finding the time. Teaching, actually, is gratifying because it gives you something like a feedback, and I get a lot of it for my own use. I always say that I teach selfishly. BJ: No, I really do! Otherwise, it’s not interesting; I’m not interested. I think teaching selfishly is what makes teaching interesting for the students, too. BD: I was going to say that the students, I’m sure, get as much out of it as you do. BJ: Yes, well this is the way Messaien taught himself. He gave us his own point of view, and through his point of view we evolved ours. We didn’t have to agree with him, but it was so stimulating — to get this very biased point of view — that we had to find our own after that. I don’t believe in neutral teaching. That’s just bunk. It doesn’t exist. BD: Well, is composition really something that can be taught, or must that be innate within each student? BJ: That’s a big question. Some of it can be taught. I have no pre-set method — contrary to some of my colleagues who teach their own method. I take each student by his hand and find out who he is, and then try to help him realize what he’s trying to do. Most of my work, generally, is to try and give him some kind of culture. I say him because most of my students are men, I have to say. There’s still a problem from that standpoint. Very often they don’t really know much of the history of music, and I think they ought to. So a great deal of my time is spent analyzing not only my work, but other people’s work. BD: To give them a basic grounding? BJ: Yeah, uh-huh. Of course, this is what I teach, mainly, at the Conservatory. BD: You’ve been doing this directly now for about twenty years. How have the students changed from the seventies through the eighties, and now as we begin the nineties? BJ: How they have changed? BD: Yes — their abilities and perceptions, etcetera. BD: Do you think conductors should conduct from the point of view of the composer? BJ: Some of them do. The best ones do. BD: Have you conducted some of your own music? BJ: A little bit, yes. I think it’s important to know what the problems are because it helps you notate properly. I have tried a little bit. I studied. I went through Besançon; in fact I got a prize in Besançon years ago. BD: Also you got some kind of a prize from a group here in Chicago, which I know nothing about. BJ: The Copley, Norma Copley? BJ: I don’t think it exists anymore. It was a foundation. They were very much linked with Darius Milhaud, and I guess some of the Milhaud students got prizes from this foundation. I never met them. I did meet Norma Copley at one point. BD: Let me inquire about the recordings. Are you basically pleased with the recordings that have been made of your music? BJ: Oh, yes, very pleased, very pleased, especially with one of them which was issued in ’67 and had quite a long career at that time. It went to America. It’s my Quartet Two with coloratura and string trio and was issued in America on the Angel label. It was issued in France first and then in America, and it lasted about ten years. Then it was out of print and it has come back on CD. It’s a fabulous recording. One doesn’t record anything today that way. It’s just wonderful! BD: How was it done? BJ: It is a fifteen minute piece which we recorded for eight hours. And I was there for the splicing and editing, which took another three days. So it’s just perfection. It’s just wonderful! But recordings are not made that way today. I was very lucky. I have another recording which is all devoted to my music. It has my Piano Concerto, and that was very well recorded; also my Viola Concerto and two other pieces, all of which are very well recorded. No, I have no bad recording! BD: If these recordings are so perfect, does this then set up an impossible standard for future live performances? BJ: Some live performances are very interesting. At this point today, this is the way many pieces are recorded. A good live performance is taken as a recording. I don’t think there’s a special studio performance for recording any more; most of the time, at least in contemporary music, that’s the way it’s done. Here in France we have a national radio which gives us very high standard performances of our music, and several contemporary music groups here, too. BD: Besides that, what are the differences between the French music scene and the American music scene? BJ: From what I see, contemporary music is rather limited to universities and small groups which have to struggle for funding. I understand it’s not very easy. In France, it’s been like this for a long time. I’m not absolutely sure this is a good thing, but we now have groups that are sort of institutions, which get public funding — like the Boulez group, which is very good, and two or three other groups which have been in existence for now nearly twenty years and are doing very well. Other groups have come along, come and gone in fact, but these three are still alive. Most of the contemporary music that you hear today is given through these groups and the radio. The radio is extremely active from that standpoint! We have two orchestras on the radio — can you believe it? — and choruses and concerts all year ‘round. It’s a big institution, as the NBC used to be. That’s a very sad situation. BD: Is there a big following amongst the public for contemporary music there in Paris? BJ: That’s a big problem, and I have my ideas on the subject. There is a following. It’s like everything else today, it’s totally specialized. There’s an enormous following for the Boulez group, enormous. Everything is packed! There’s also a following for the other groups, like the Itineraire, and [French]. These are the main groups. They have a following which is always, more or less, the same people. When they tour, they go around Europe, mostly. I don’t think they get to America. The Boulez group gets to America, of course; they get everywhere. But the following is always a specialized following, just as baroque music has their following, just as quartets have their following, and so on. I don’t think it’s a very good situation. It has resulted in the other groups not playing any more contemporary music under normal conditions. BD: You’d rather your piece would show up on a mixed concert, rather than just an all contemporary concert? BJ: Yeah. This has happened to me several times, thank God, and that’s where I want to be at this point because of my age. I was recently played on a string trio program where there was Schoenberg, Webern, Mozart, and Jolas. Well, that’s nice! It was a big success and there was a normal public. BD: You don’t fear the competition? BD: You have a piece that is identified by three initials, and it says that you have never identified what the initials stand for. BJ: That piece is on a record, so you’ll hear it. J.D.E., are you talking about that? BD: Yes. And you’re not going to reveal to me the secret? BJ: No, certainly not. I’ll tell you a story about that. This was a time when that kind of initials came up in today’s world. It was a way of defining, shall we say, the nature of the piece, which was to be empty and then to be filled with something. It starts out like a very, very, sort of desert kind of music, and then it gets fuller and fuller and thicker and thicker. That was more or less the idea that put in those initials. But the initials do mean something, and it means a lot of things. Darius Milhaud — he was one of my teachers — when I sent him the piece, he sent me a very funny letter giving all sorts of interpretations to those initials. One of those was, in French, Jolas Droît Écrire [Jolas Must Write]. The other one was Juliet des Ésprits which was the title of a film by Antonioni or Fellini! [Both laugh] And one of the instrumentalists who played it the first time said, “Oh, I know what that means. It means J’ai Des Ennuis,” which means I have troubles or I have problems. BD: Are any of those ideas correct? BJ: Everything you want to put in is okay with me, and I have my own interpretation. BD: Has anyone ever hit your own interpretation? BJ: Some very secret, yes. I told some people. When I’m dead, you can find out. It’s not one of my favorite pieces, so it’s not important, I don’t think. BD: Is it right that a composer has favorites amongst the pieces? BJ: I don’t see why he shouldn’t have that right, really. BD: Are they not all like children, and you must give almost equal weight to each child? BJ: That’s morally speaking. Don’t you have favorite children, too? Some people do, you know. BD: I guess some children succeed in one way, and other children succeed in other ways. BJ: Uh-huh. Anyway, I do think many composers have favorite pieces. There’s no doubt about that. BD: Without mentioning any names, are there pieces that you feel you should not have written, or you would rather have withdrawn? BJ: No. No, those pieces I withdraw. I do not let out any piece that I should feel I should have withdrawn. Any piece out is okay, but I have some favorites, that’s all. BD: I just wondered if a piece had gotten some playing, and you really just decided you didn’t like it once it’s been published. BJ: No. Once it’s published, I have no right on it. The publishing is important. I had a piece that I did not want played, which somebody had in manuscript and played nevertheless. I don’t think that’s right. I had not published it. There was some reason. She should have let me know. That’s not right. But once it’s published, anybody can play it. There’s nothing I can do about that. BD: When someone comes upon a piece of yours and performs it, is there ever a time that they discover things in the score that you didn’t know you’d hidden there? BJ: Very good feeling. Very interesting. I’ve had this experience many times. BD: When you’re writing a piece and the notes are coming out, are you always in control of the pen or are there times when you feel that the pen is guiding your hand? BJ: Both. Sometimes you’re in control, sometimes you’re not. That’s the whole idea of composition. You have to let your pen go sometimes. [Both laugh] And then, you know, catch it before it leaves! BD: You never fight with the pen? BJ: Oh, yes, sometimes, sure! Sure. BJ: Sometimes I don’t win, and then I start something else. Sometimes I win. Most of the time I win! BD: One last question about compositional technique. When you’re writing and getting all of the notes in place and tinkering with it a little bit, how do you know when to put the pen down and say, “It is ready to be launched”? BJ: Really my problem is not that one. My problem is to know where the piece starts. Once the piece is started I know where it finishes. For many years I always thought I was starting a piece, and I was actually in the middle. So then I had to work back to the beginning. Once the beginning and the middle was done, then the end was no problem. I knew exactly. It just had a strength to it that made it go someplace and not another place. There was no way it could go anywhere else. So I knew what the end was going to be. That’s not a problem. BD: What about when you’ve got all of the notes on the page and you’re revising and tinkering? BJ: Well, that’s part of the composing. It’s not a set method for all pieces. Each piece has its problems. I’ll tell you a story. One of the pieces that’s on the record is called Points d’Aube, a concerto for viola and winds. The first performance was not a success. I’ve rarely had pieces that didn’t work in first performance, and this one was badly received on the whole and by everybody! Sometimes people don’t agree, but this was everybody. One of my good composer friends took me aside and said this very strange thing, “This doesn’t count in your production.” I was quite mad to hear that. I don’t like to hear that kind of thing. Rarely one does say those things, but I started thinking; nobody liked it. There must have been something wrong. BD: Obviously you liked it! BJ: I’m not sure I liked it at this point. I was a little unsure. So it wasn’t published; it had been performed, so I revised it. I don’t do this very often. I really revised it, which is very hard. To take a piece apart and put it together again is difficult, not to mention the fact that you have to write parts again. So the new version was performed and my friend was there. “Oh!” he says, “I’m so glad it works now! I’m so glad you changed the end!” Well, it’s the only thing I had not changed. BD: So you had the right ending all along, but not the right lead-in? BJ: Yeah, that’s exactly it. So now it works! BD: Let me ask the big philosophical question. What is the purpose of music in society? BJ: That’s a big question, indeed. It’s a question of what’s the purpose of art; what’s the purpose of communication through art. That’s the whole question. It’s a necessity from the part of the composer. I guess a lot of people can do without music, or they can do without painting, or they can do without reading. But quality of life is not exactly the same, that’s all. It’s very hard to answer that question. It’s a total necessity for me to compose. I can’t do without it; it’s like breathing. So I trust that somebody will get my message, somewhere. It seems to happen, sometimes. BD: Are you writing for a specific public, or a small public, or the whole public? BJ: Hopefully I write for the whole public. I think, as the years go by, from what I hear I have the feeling that I have a public which is not exactly the same public as most composers have today. It’s a public that includes people that I wouldn’t meet normally in life. Sometimes I meet somebody who says, “I like your music,” and I don’t even know who he is, or who she is. My hope is that my music will reach most people — I mean the greatest public possible. Not for glory, but just because I like to feel that I am not just addressing a small group of people. I’m not interested in that. BD: Is there a balance between an entertainment value and an artistic achievement in music, or in your music? BJ: There probably is, yes! I would like you to define what you mean by entertainment. The pleasure that you get out of it, is that it? BJ: Yeah, well there’s nothing wrong with pleasure! I’m not against pleasure at all. That part of it I certainly would agree to that. I seek to produce pleasure with my music; I don’t like it to be painful. BD: But obviously your pleasure is going to be different than other kinds of pleasures. BJ: Oh, sure, absolutely. That’s evident. BJ: Not very, no. If I stop to think about it, I don’t quite see where we’re going, nor do I see where we are going in general. I mean I don’t quite see where music stands. In fact, it’s something that I don’t want to think about too much, because it would sort of result, logically, in my stopping to write sometimes. But I can’t do that! BD: Sounds like a paradox. BJ: Yeah, yeah, absolutely. But I think a paradox can be healthy, too. BJ: I don’t know if you realize how important that’s for me. It’s both a problem and a joy that I have dealt with all my life, through all kinds of works. I have written about it, in fact, outside of music also. In fact, it has led to opera at this point. I have now reached my third opera. 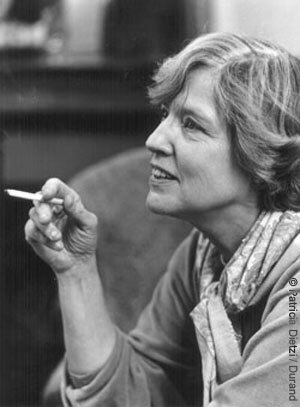 I was in Chicago in 1976 with an opera at the University of Chicago. We also went to Minneapolis and Washington and Philadelphia. It was a French production of an opera I wrote called The Riverside Pavilion. It’s to a Chinese text. There was sort of a French package that came over; there was Peter Brook and myself. BD: You were born of American parents, but you’re French. How do you consider yourself, if at all? BJ: Well, the fact that I have spent most of my life in France has made me, I guess, more French than American, although I feel very much sort of midstream sometimes. I am felt as quite exotic when I go to America, quite European. I was born in Paris, raised in Paris, and I only spent six years of my life, steadily, in America during the war. Otherwise, I’ve been coming and going about once a year for short periods. I like to be in America. I feel very much at home, yet my home is here in France. BD: There’s not a trace of accent in your speech, though. BJ: Oh, that’s very nice! There was a point where I had totally forgotten my English. Can you believe it? It was because I stayed away for twenty years, I guess. I had to learn it over again. BD: [Laughs] Well, you’ve re-mastered it perfectly! BD: And thank you so much for mastering the art of being a composer. BJ: Thank you very much for calling me today. a program on WNIB for her 65th birthday, and then again for her 70th. I sent her a note about the second program, and she made this lovely reply . . . This interview was recorded on the telephone on July 17, 1991. Portions were used (along with recordings) on WNIB later that year and again in 1996. The transcription was made and posted on this website in 2009.